From ancient times the writers and philosophers of India have imagined a space that is the heaven of the gods and goddesses and they called it Devabhoomi, the land of the gods. It is a land surrounded by lofty mountains rising towards the skies; that is watered by rivers and are surrounded by green valleys and forests. The devotee of each deity imagined a unique heaven for their god. For Shiva the wanderer and ascetic it was the craggy, ice covered Mount Kailash. For Vishnu as the lord of the universe it was the golden Vaikuntha. Then Indra as the commander in chief of the army of the gods reigned over Swarga, the heavens where deities lived among demi gods like the celestial maidens, the apsaras and the musicians, the gandharvas. What they all agreed on was that this land of the gods was somewhere in the Garhwal Himalayas. So since time immemorial the pilgrim’s trail has led here with pilgrims trekking along the narrow hill tracks, facing the cold and the wild forests for months to reach their destination. Badrinath has always been among the greatest of the many tirthas that stand in this Devabhoomi in the Himalayas. 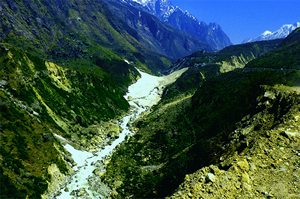 The Himalayas are dotted with rivers, streams and waterfalls and they have inspired the myth of the Ganga River. The story goes that when King Bhagirath prayed to Ganga to come down to earth she was reluctant to leave Swarga. Finally when she turned towards the earth she was an angry river and she flowed so fiercely that Brahma feared she would wash away his creation. So he requested Shiva to stop her and the benign god calmly placed his head in her path. Poor Ganga got lost among the coils of Shiva’s hair and emerged as many smaller streams. Many rivers like the Ganga begin their journey at glaciers, others like the Indus and Brahmaputra at lakes and when these streams meet these confluence points are called prayags. The Ganga is a combination of a number of rivers like the powerful Bhagirathi, Mandakini and Alakananda and the smaller streams like the Nandakini, Dhauli Ganga and Pindar Ganga. Before it appears on the plains at Haridwar there are five prayags or confluence of rivers that are considered to be sacred and all of them have their own temples and mythology. After starting their journey up the hills at Haridwar, pilgrims visit the Panch Prayag before heading for Badrinath. Moving northward the first confluence is at Deva Prayag where the Alakananda meets the Bhagirathi and it is from here that the river is called the Ganga as it flows down to Haridwar where its journey across the Indo-Gangetic plains begins. Deva Prayag has the Raghunath Temple named after Lord Rama as it is said that he and his brother Lakshman performed a yagya in atonement for the killing of Ravana. There are two sacred pools beside the rivers. The next on the route to Badrinath is Rudra Prayag where the Mandakini flows into the Alakananda. The Rudranath Temple here is dedicated to Shiva. 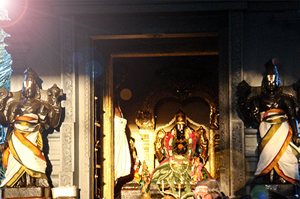 It is said that the sage Narada worshipped Shiva here and the god was so pleased he gave him the ragas and raginis of Indian classical music. Karna Prayag is where the Pindar Ganga meets the Alakananda and it is named after the hero of the Mahabharata, Karna. He performed many austerities here and the sun god Surya who was his father appeared before him and gave him the magical armour called the kavach and kundala that made Karna invincible in battle. The fourth prayag, Nanda Prayag is at the confluence of the Nandakini and Alakananda. Then at Vishnu Prayag which is the final prayag before Badrinath, the Dhauli Ganga meets the Alakananda. The great tirtha of Badrinath stands above these five prayags by the banks of the Alakananda River. Pilgrims coming from Rishikesh reach Deva Prayag, the confluence of the Bhagirathi and the Alakananda and then follow the Alakananda while the Bhagirathi takes them to another great tirtha, the dhaam of Kedarnath. Vishnu reigns at Badrinath and it is Shiva’s kingdom at Kedarnath. The Badrinath tirtha also stands at the confluence of two rivers, the Rishi Ganga and the Alakananda. The temple stands in a valley surrounded by peaks covered in perennial snow and among them is Mount Neelkantha, named after the blue throated Shiva. The name of the tirtha comes from the name of a berry called badri that grows in the hills here. It is said to be the favourite fruit of goddess Lakshmi who is the consort of Vishnu. The god had come here in the form of the sage Narayana to meditate and Lakshmi turned herself into a badri tree to provide shade from the sun to the meditating rishi. So the temple built here is called Badrinarayan. Ancient texts mention two famous philosophers who came to this region to meditate and compose philosophical treatises called Rishi Nar and Rishi Narayana and it is believed that in their later birth they became Arjuna and Krishna of the Mahabharata. Another myth explains the image that is worshipped in the Badrinarayan Temple. The stone image shows Vishnu in the yogic, meditative posture of padmasana, sitting cross legged with his hands in his lap. Usually Vishnu is depicted standing or lying and very rarely in the padmasana pose that is more common for Shiva and the Buddha. It is said that once Lakshmi was massaging his feet and a sage had scolded Vishnu for giving in to such earthly pleasures. An apologetic Vishnu then meditated in the padmasana in penance and only stopped when requested by Lakshmi. 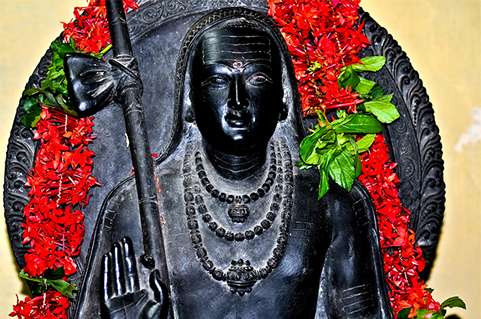 The most famous Hindu pilgrim was the scholar Adi Shankaracharya. Born in late 8th century in Kerala he wandered across India working to revive Hinduism. He was himself a devotee of Shiva but played an active part in the establishment of a Vishnu temple here. Shankaracharya began to tradition of monasteries or mathas that became centres of Sanskrit scholarship and philosophy. He established four mathas of the sect called Dasanami Sampradaya in Jyortirmath (now called Joshimath) near Badrinath, Dwarka in Gujarat, Puri in Odisha and Sringeri in Tamil Nadu. Shankaracharya gained moksha at the young age of thirty two, probably at Kedarnath.